How are learners connecting with the world? Explore stories from educators, schools, and programs that support globally connected learning. 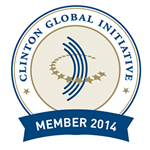 Established in 2005 by President Bill Clinton, the Clinton Global Initiative (CGI) — an initiative of the Bill, Hillary, and Chelsea Clinton Foundation — convenes global leaders to forge solutions to the world’s most pressing challenges.